Go where your clients have gone if you expect to reach them… and that currently means Facebook, now 600 million strong worldwide and rising. Speaking at a Facebook headquarters Q&A session on Tuesday, developer Mark Zuckerberg says a ‘dislike’ button is nearing the testing stage. While many people are going to have their wishes fulfilled with the arrival of a counterpart to the Facebook Like Button, the Dislike Button may be the ultimate undoing for those in business who try to use Facebook as a way of engaging potential customers with a ‘Buy my stuff’ shoutout. After enough slap downs, even the thickest of skulls might begin to comprehend the more “socially” correct form of advertising. Zuck is trying to figure a way to allow people to show “empathy,” without the site becoming like Reddit. It will be interesting to see if more Dislikes cause a post to dry up or if a wildly unpopular post gets the same boost in organic distribution as a well-Liked post. There are lots of other buttons I’d like to see. How about a Sympathy Button, useful when someone breaks a leg, their cats dies or their partner unexpectedly dumps them? Or how about a Baldfaced Lie Button, as we move into the political season? Of course some people are pleading for a TMI Button and a Meh Button. The ongoing curtailed distribution of your Facebook Business Page updates is discouraging but, here’s a way to boost their EdgeRank by encouraging more likes and comments. Write and publish an article on your Website. Then, post a link to it along with an enticing comment on your Facebook Page. Then, click on the dropdown arrow in the upper right corner of that status update and click the link to Embed Post. 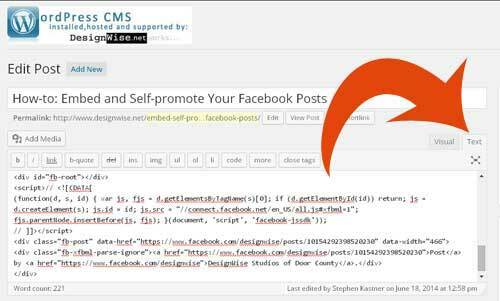 Copy and paste the embed code back into your WordPress Post or Page by clicking on the Text tab (next to the default Visual tab) located in the upper right corner of the content editor window. 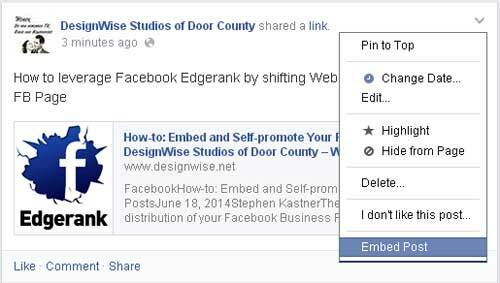 Paste the Facebook embed code at the bottom of the editing window and then click Update. Now, when site visitors see the Facebook Post (embedded below), they can immediately Like and Comment there – promoting your Page and boosting the Edgerank of that Facebook post as well. So… need I say it again? Post by DesignWise Studios of Door County. RESULTS: Within 24 hours, the news feed distribution of this Facebook post has jumped to more than 10 times the average of previous posts! There are plenty of new Facebook users that decide to start creating a business presence by faking a Personal Profile page. In a short time, most of these business users soon come to realize the shortcomings of such a decision but by then, they may already have hundreds of “friends.” If they are really successful, they will be forced to face the fact that Personal Profiles are capped at 5,000 friends. Facebook Business Pages are privileged with unlimited “Likes” – without fans having to ask and then wait to be granted access. 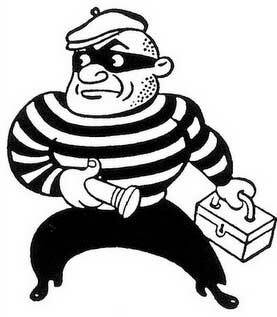 Businesses that impersonate people are heading toward a life of Facebook crime… by creating an impostor Profile you risk being deleted as a clear violation of Facebook policies. Under Facebook’s terms of service, users are required to use real identities and not hide behind false or anonymous accounts, a violation that can lead to Facebook closing an account. There are a completely different set of rules for Facebook Pages. One of the biggest disadvantages of trying to use a Personal Profile for Business is the loss of Tabs & Apps. You can add all of the silly games you want to your Profile but none of the useful custom tabs or Apps that are available only for use on Business Pages. For example, Facebook apps can automatically showcase your YouTube channel, add a Google+ Tab, an e-mail signup form or even embed a full-blown shopping cart into your Facebook Business Page. 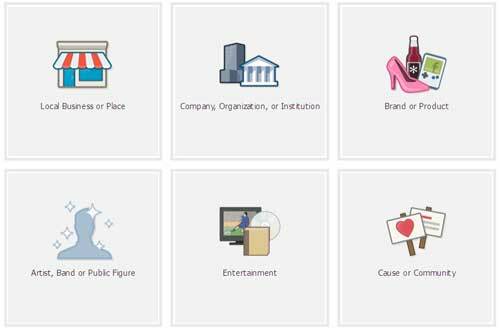 Facebook also offers Business Page administrators a variety of powerful tools that help you manage and track engagement, a benefit denied to Personal Profiles. Previously, you had no choice but to bite the bullet and start over… but now, Facebook Allows Profile Pages to Become Business Pages. At this time only your profile photo and friends will be moved to your new Page. No other content will be moved. You will still be able to log in from your original email address and password. Click to learn more about how and why to convert your Profile into a Page. Then, you can click this link when you are ready to begin your Profile To Business Page Migration. Once you get on the right track, you can build a much greater audience,, add a custom landing page, perhaps use Facebook advertising and add a number of other apps and enhancements. Sandberg’s comments, delivered at a conference in September, 2009, may have underestimated the speed at which it the personalization is taking place. Some fear that news aggregators will begin to take over the delivery of personalized content, based on user demographics extracted from your online grid profile. Media personalization is already well underway, but it’s not being crafted by an external source. Leave that effort to the adservers. The personalization that Sheryl Sandberg describes is being shaped by the the users themselves. As they decide to “Like” a Facebook page, that content stream becomes an element in their newsfeed. Savvy business Website publishers are becoming content creators, learning to broadcast their news feed output to a Facebook page and to every other popular social media site, creating their own content-rich inbound “advertising” grid. Now, It becomes much more important to “be about something” in order to be “marketing with meaning” as Bob Gilbreath describes. The old days of tell-and-sell, top-down advertising is being replaced by a people-centric model and it’s happening much faster than predicted. Facebook COO Sheryl Sandberg, “Knowing is Better” on UStream live 09/22/09. Four months later, Facebook’s Malorie Lucich announced that users and publishers would be further empowered in Creating Your Personalized News Channel. Creating dedicated “lists” will allow the user to segregate and then display select newsfeed updates from friends and/or from the Official Facebook pages they “Like.” Facebook also provides publishers with Facebook Connect allowing offsite users to login at another Website and interact. After seeing referrals from Facebook grow 680 per cent in 2010, The Independent began redesigning different ways to personalize, aggregate and segment their news feeds into Facebook with a variety of new ‘like’ features on independent.co.uk. So starting with a few key areas of the site, we’ve been developing the tools to let people get their news from The Independent through social networks in tighter categories, designed to better reflect the parts of our editorial output you particularly enjoy. To that end, you can now ‘like’ all of our commentators on Facebook, and if you do then when they publish a story it’ll appear in your news feed. So if you want to know what key writers such as Robert Fisk and Johann Hari are covering each week, just follow those links and click ‘like’. Commentator’s like buttons are, for now, confined to their author pages, which you can get to by clicking the names in the dropdown navigation visible when you hover over commentators on the Opinion section. While none of my clients’ Websites nor any of my own publications can compare themselves to a major London news publisher, we can still take advantage of the opportunities presented by Facebook in terms of networking to create a grassroots distribution network. 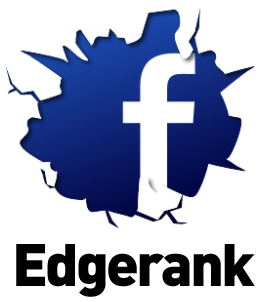 Facebook Apps like NetworkedBlogs permit content to be spread in a viral manner from one to many. 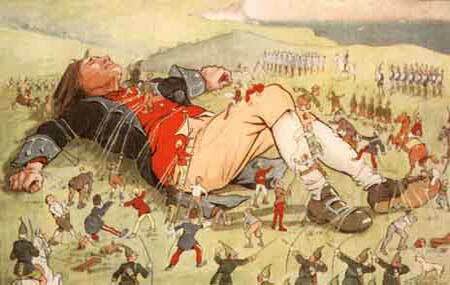 With the consolidation of media that has taken place over the last decade, I often compare this community-based effort to Gulliver vs the Lilliputians. Learn how… at our monthly Social Media Breakfast Door County meetings. What if you could scan through the status updates of 500 million people to search for any key words you were interested in tracking? How about if you could split it by gender? What would you search for? Created by Will Moffat, Peter Burns and James Home, Your Open Book was developed to demonstrate what they feel is wrong with Facebook’s privacy settings… that they are hard to find and even harder to adjust. The developers of Your Open Book are proposing the addition of a simple privacy slider to each user’s Facebook profile page and they have created this free search tool to call attention to their proposal. Meanwhile, I think their application can also be used in lots of different ways to connect and communicate. But, it’s a lot like joining the dark side, when you start invading the privacy of strangers. Nonetheless, you might use it to search for mentions of a brand name, a restaurant or a geographic location. The possibilities are endless. Want to see what people share on Facebook with the entire world — perhaps without realizing it? There’s a new site that makes this easy, Openbook.